Didn't we just start the new year? How is it that we are now in February? Anyone else a bit surprised that we are now in the second month of the year? Or am I the only one who is still wishing that the "January" projects had been finished before now becoming "February" projects? 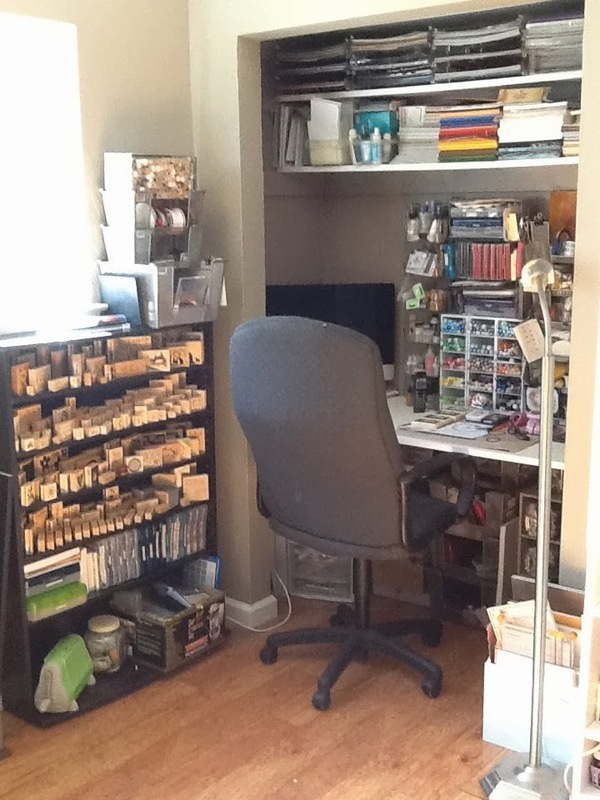 Remember the stamp organizing project I started in January? It has now become a "February" project, and I am determined to finish it by the end of this month! I do have to say that what I have so far organized is great, easy to find, easy to use and put away, just need to finish with the rest of the stamps...sigh. Ok, how about some cools stuff today? First of all I wanted to thank Carrol who sent me a link to a free magazine! Yes, absolutely free! The magazine is called " Scrapbook and Cards Today," and it is published in Canada. If you want to get the hard copy all you pay for is postage, the online version is completely free! You are going to love this free magazine, it is filled with projects. lots and lots of scrapbook and card ideas, and some wonderful techniques as well. You can download the magazine to save on your computer, and if needed you can print out only the pages that you want. What a great way to start February! 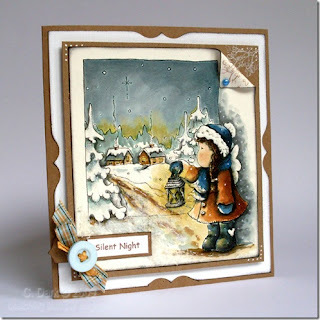 This card is colored using distress inks, and the color, the depth of the image is simply amazing! Christine Dark is artist who created this card and I have to say that I am now running to get distress ink refills to try and duplicate her technique. Oh, this is just one example of the many, many cards this artist has created, click here for her Magnolia blog, and here for her other blog. What I love about the way Christine colors her images is how everything seems to come to life, the colors are beautiful and give depth and dimension to the stamped image. I spent two hours looking at both of her blogs, simply some of the best coloring I have ever seen. I wrote Christine and asked her if she had a tutorial for her unique style and she wrote back and said that she hopes to get a tutorial done in the future. When Christine does have a tutorial up I will make sure to post it on the blog. Christine did share a few tips with me, one is to use a regular paint brush instead of the water brush, Christine said that you have more control over the coloring with a regular brush. Cats Whiskers: Very easy to follow tutorial on basic coloring with the distress inks. StampARTic: Great picture tutorial, step by step of how she works with the distress inks, and she has some great tips as well. Winter CHA Videos: Click on the link to find three pages of videos from Winter CHA. Lots and lots of really cool products coming our way! Speaking of new products, I cannot WAIT to ge my hands on the new Cuttlebug "Emboss Plus" folders! These new folders are larger, they cut and emboss with one pass and I predict will be in high demand. I am most interested in the "Chic Circles," "Fanciful Labels," and "Embossed Tags." (though these are not the only folders I may end up purchasing). Wow, that card is colored in so beautifully! I love it! I feel like I want to go out & buy some distressed inks now! Maybe I'll wait for her tutorial so I can know what I'm doing! !